Sometimes photographers get into a rut. Admit it, we all do. But Steve, what can I do to get out of my photography rut? Well I'm glad you asked. 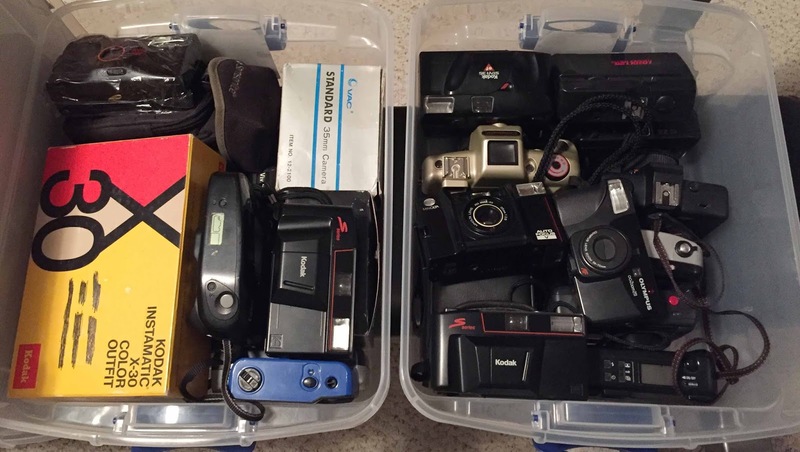 I do it in a bunch of ways, but primarily by shooting film. As you might know I'm primarily a studio based digital editorial & beauty photographer for most of my photography. That's my "professional" photography gig. But to answer the question, to keep fresh I take my photography in other areas, genre's, themes, etc. to stay out of the rut. That's really the easiest thing to do. You can shoot a personal project, you can stick to a consistent theme for a shoot, shoot with a single lens, stick to 36 shots, shoot only the color blue for a project, copy a magazine editorial, shoot the same image every day for a month, etc. etc. You get the idea. Well, like I mentioned, to keep fresh when I'm not in studio I shoot street photography and I shoot with film cameras. 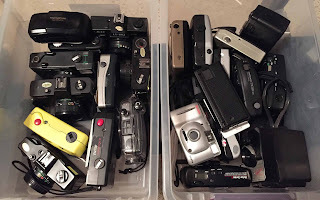 Except for a few film cameras that I like to shoot regularly, my "stay out of a rut" gig is to shoot a different film camera every time I go out. But wait Steve, isn't that expensive? Not really. 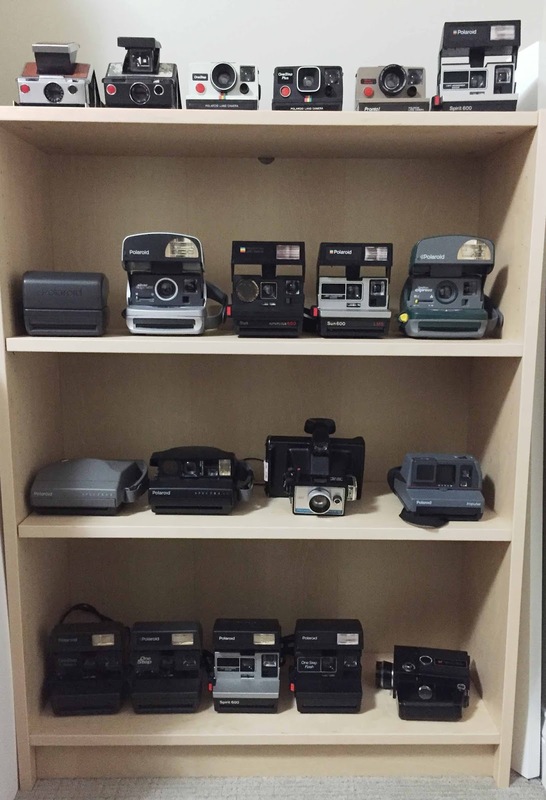 There are literally thousands of film cameras out there no one is using. 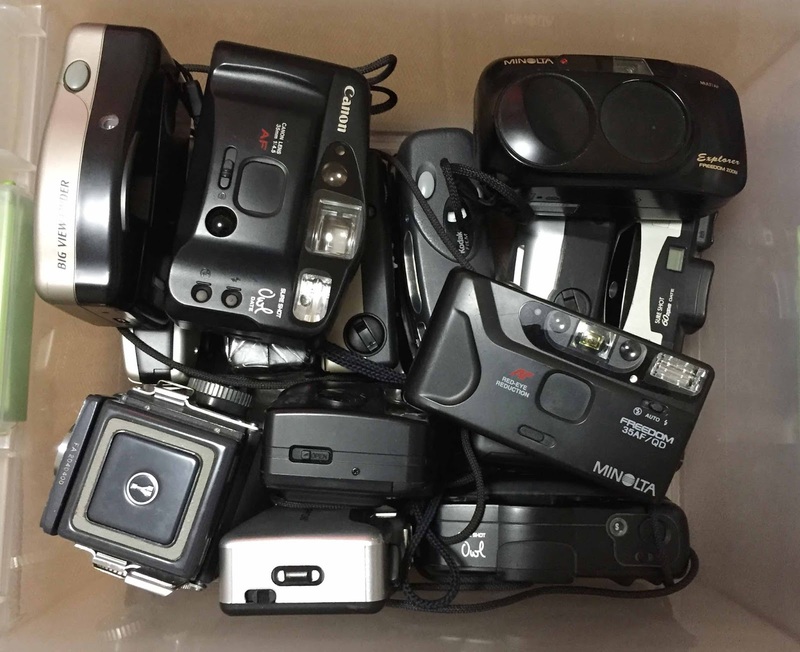 You can ask a friend to donate their unused cameras, you can buy them online for little $$$. Of course most quality film cameras hold their value and can be pricy. I'm not talking about those. 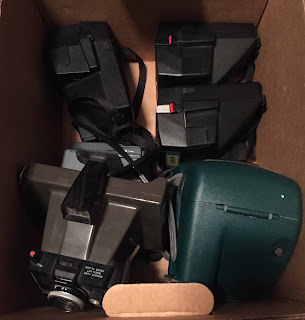 I'm talking about stopping off at Goodwill and picking up 3 cameras for $10 type of bargain. As an example, here's my current inventory of film cameras. 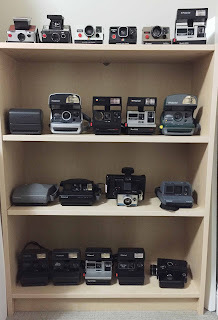 I have 35mm, 110mm, 120mm, & Polaroid film cameras. 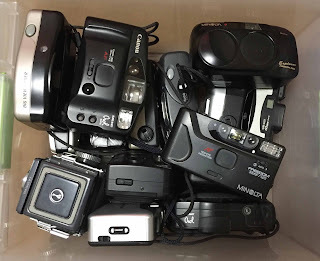 Most of these cameras (almost all of the point & shoots) were picked up at Goodwill. The rest were given to me, purchased online, or purchased at flea-markets. Bottom-line, if you are a smart buyer you can get good value. So that's my "get my hiney out of a photography rut" solution, I shoot film and different cameras. So what have you got??? A bin of cameras ready to be used!